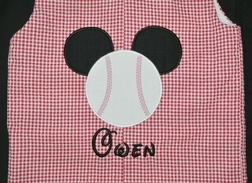 A customer was going to the little league world series at Disney and just had to have something baseball Mickey. Sooo, we created the John John for the little brother and the shorts set for big brother! We start with red gingham seersucker and craft a John John or shorts The John John's shoulder straps fasten with two black buttons and has snaps in the crotch UP TO SIZE 2. The shorts are completed with black gingham cuffs. 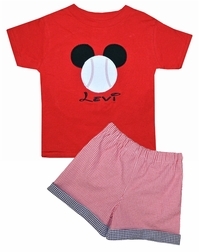 The red shirt that is paired with the shorts and the John John are appliqued with Mickey Mouse as a baseball including the red stitching! 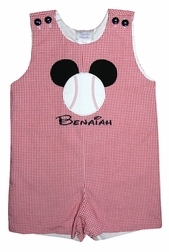 Your little one's name is monogrammed under Mickey baseball in black Disney font.